When I was in my car accident (October 2008), my life suddenly came to a complete hault! I couldn't work, I had to move back home with my parents (oh, how I'm so grateful to have such amazing parents! ), and I had to face a whole slew of imperfection that I wasn't prepared for. We'll fast-forward a bit (partially because I'd rather not even try to remember, and partially because I simply can't remember, the months directly following the accident). "I do not believe that sheer suffering teaches. and the willingness to remain vulnerable." After living with my parents for the 10 months following the accident, I moved to Tulsa to start graduate school (and live alone, until Jeremy and I were married and he finished school early the following year). I felt that I was ready to try to return to school... and/or maybe I just couldn't cope with the thought that I wouldn't be able to return to and do well in school. I didn't have a clear-cut financial plan, but I was able to get an assistantship lined up a few days before classes started. Everything seemed to be falling into place. So, I became a full-time student, a part-time graduate assistant, and I was planning a wedding for mid-semester... not the best of ideas, but I was excited and determined... things that I hadn't felt in months. My health didn't play along well with my plans, though. I felt like I was keeping up well with my classes, so I never disclosed or sought accommodations for my disability... at least not until the end of the semester, when it was "too late." I was scared to death by some of the things that I was feeling for the first time... I'm actually scared to even say it here... I'd never even thought about cheating before I started having so much trouble with grad school. I lost a lot of productivity because of my health, and my brain simply didn't work so much of the time -- I wasn't able to read and/or I'd start reading and have to constantly re-read passages, knowing that none of it was going to my memory... I misunderstood even simple questions... I couldn't think on the spot, which affected my participation in class... I struggled with recalling information on tests, even once I sought assistance and was given more time for testing (it helped a little, but I still struggled so much). I HATED myself for the mere fact of even having thoughts of cheating. I didn't act on it, but that showed in many of my grades. It was an extremely rough cycle. I did start seeing a therapist / counselor on-campus, but it didn't help at all. I started seeing someone off-campus in the spring / summer, who was able to help me with my PTSD, which had been getting worse (flashbacks, still super-jumpy in cars, etc). It seems to have helped a lot (with my PTSD, but not with coping with chronic pain), though I still struggle with being jumpy in cars. Anyway, I completed the semester by being placed on academic probation (because my GPA was 2.67, less than the required 3.0). That was a breaking point for me! I know that grades aren't everything, but school and academics has always been "my thing." I've always identified myself, at least in large part, by my intellectual capacity. And, then, I found myself on academic probation?! It wasn't even just that... I was barely able to work any hours for my graduate assistantship (I won't even say how few I was able to work because it's embarrassing and heartbreaking to me). Between my migraines, anxiety, and trouble keeping up with classes... I just couldn't do it. Then, the spring semester got even worse! My graduate assistantship was with a different professor. Between her being sick, my health being worse than ever, and lack of communication between us... let's just say that I was chewed out and humiliated several times, putting things like my dependability and hard-working qualities into question. I hit another breaking point! All of those things that she criticized me about (communication, dependability, availability, and hard-working) are things that I felt confident and proud of myself for being... at least before the accident. Another huge piece of my identity missing. Back to academics - I worked so hard during the spring semester (on academic probation), and utilized the assistance from the school's center for student academic support - Jeremy and I were married, and he was living with and helping take care of me. I was determined to get myself off of probation. I knew I may not be able to return to school, but I wanted it to be my choice - I couldn't bear the thought of getting kicked out of graduate school (the pain of that thought was even more painful than the thought of not being able to finish the program). I completed the semester with a 3.67 GPA, which raised my overall GPA to 3.17. My health took a huge beating, though. I decided to take a leave of absence, not knowing if I'd ever really return. It was extremely difficult to make the decision to not return to school to finish the 2-year program (plus internship). There were a lot of different considerations in making the decision, but it was the right choice for many different reasons. Honestly, I knew for a while that I wasn't going to return, but I couldn't handle making it an official decision... I had to work to get to a point of accepting it, first. This kept us in Tulsa longer than we would've liked to have been, but Jeremy was very understanding that I needed to really come to terms with my decision about school before I could leave. I follow your blog, and after reading this post I just want to say, I really feel for you!!! Thank you for putting yourself out there and getting vulnerable with us to let us see that we aren't the only ones grieving for "what could have been." It must have taken a toll on you to relive this stuff, writing it all out. 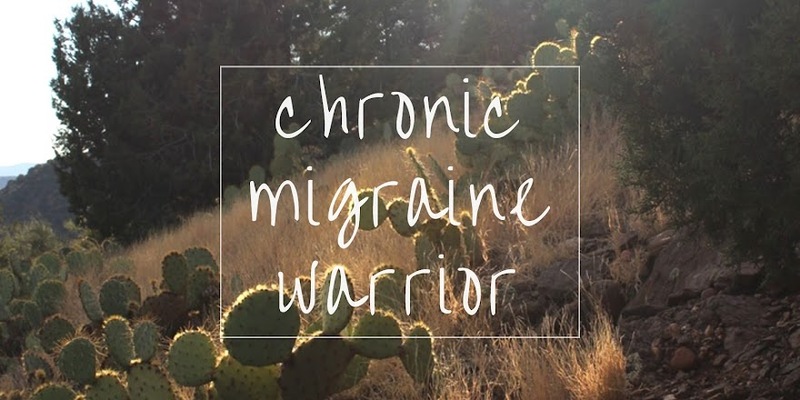 I've suffered from migraines, chronic fatigue, fibromyalgia, and a myriad of other illnesses that go along with those, for 10 years. I had dreams for my life, too - I'm only 33. I am also one of those people who has to have everything perfect, a high achiever. This blog serious is right on! 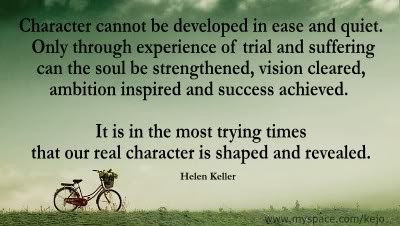 Accepting imperfection is a continual lesson that has to be learned and relearned over and over in my life! 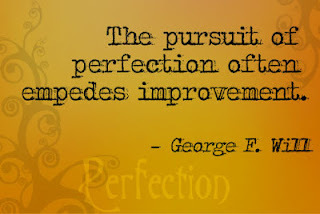 Every time I think I've got it, I start demanding perfection in another area. :-) Then God throws another devotional or blog in my face on perfection. So thank you! :-) I pray for you. Very interesting series!!! I am sure not easy to write. Thanks for sharing this with us. Thanks for reading, WinnyNinny PooPoo. I hope you're doing as well as possible. I am now officially a chronic migraineur, as I finally have a knowledgeable neuro "treating" me, or at least doing the best she can. I guess I say "official," as I now have a diagnosis. I enjoy your blog so much, and just wanted you to know I appreciate the hard work you put into it. You mentioned in another post how you miss participating in life/being with friends (in so many words). I am wrestling with that so much! I already felt pretty isolated with my other chronic illnesses, and this one sealed the deal on no more socializing...well, very little anyway. It's hard because I'm a social person. Homeschooling has become trickier, but God has pulled me through so far. I feel like I'm talking in random circles, but I wanted to let you know how encouraging your blog is. I'm a perfectionist at heart, and that's certainly been one of the top things I've had to let go. Layla, I'm so sorry to hear that you're officially a chronic migraineur, though I know that having a diagnosis can be a relief. I'm glad to hear that you have a knowledgeable neuro, and I truly hope that she can help you. Thank you so much for your kind words about the work I do on my blog. I really appreciate you sharing that with me. I wish isolation and being severely limited in social situations weren't issues that we have to deal with (on top of the chronic pain, stigma, etc). I've found great comfort, encouragement, and understanding in the online community. Knowing that others are fighting a similar battle can be comfort in itself. I'm so glad that you find encouragement through my blog. It is only through God that I'm able to open up and allow myself to be so vulnerable. But, the love and encouragement I get from my readers helps me so much. Thank you for this series. At so many points, I felt as if you were writing from inside my brain! I expect so much from myself that I would never demand of anyone else. I know I am being unfair to myself, but I habitually go to that place of guilt and self-criticism. Chronic migraines have forced me to lower my expectations. Over time, I am learning to show myself some kindness. I remind myself often that I am a child of God, and like all of God's children I am imperfect and fiercely loved by him. Thanks again for sharing your story. It makes me feel less alone. Thanks, Sue! 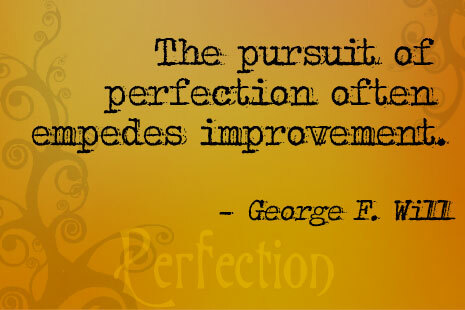 It's a long, hard, continual battle for me to fight the urge to fall under the spell of perfectionism. Thankfully, we do have a God that loves us in our imperfectness. Blessings to you.